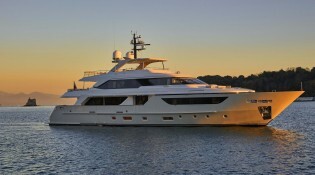 motor yacht TAKARA offering 5% off charters in Spain – Superyachts News, Luxury Yachts, Charter & Yachts for Sale. 38m Takara is offering discounted charter rates in the Balearics. A semi-open plan salon and dining has a warm inviting décor of handpicked furnishings. The lounge is situated aft offering a sofa, coffee table, armchairs and entertainment, while forward behind a light screening, is the formal dining. The salon and dining each boast a balcony, creating an exceptionally open and airy atmosphere. There is an upper lounge with large sofa and wet bar, perfect for socializing. M/Y TAKARA is a tri-deck design providing an excellent exterior living. Aft on the main deck is a shaded outdoor lounge with both built-in and loose furnishings. Her upper deck has an alfresco dining table and partial shade. There is a Portuguese style bow with seating, tables and sun pads, while further forward on the bow, is a deluxe Jacuzzi. The Sanlorenzo offers a flybridge deck, complete with alfresco dining and gym equipment. Accommodation is in 1 master stateroom on the main deck forward. On the lower deck are 2 double and 2 twin cabins, all cabins are en-suite. Twin MTU engines are capable of cruising at 10 knots and reaching top speeds of 16 knots. The yacht is fitted with zero speed stabilizers.